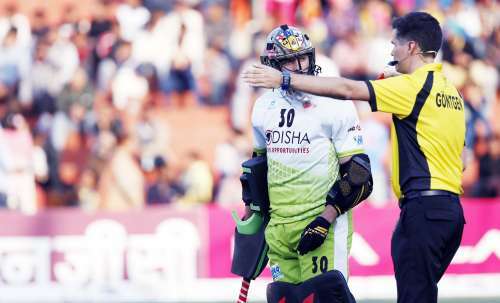 The Kalinga Lancers marched into the final of the Hockey India League after a nerve-wracking penalty shootout victory against the Uttar Pradesh Wizards. They trailed by two goals after just the third minute but turned it around early in the fourth quarter. UP equalised in the 58th minute to send the tie into a shootout, but were denied by the heroics of Kalinga keeper Andrew Charter, who led the side from Odisha to a sudden death win. “We hadn’t played a game in seven days and hence we were poor in the first half. But in the second, we were able to come back and control the game. We should have won in normal time in my opinion,” said Kalinga coach Mark Hager. He also spoke about keeper Andrew Charter’s role in his side’s win and said that it was his efforts that kept the Lancers in the match. Moritz Fuerste, who is leading the team, missed both his attempts in the shootout and was relieved that his teammates were able to pull the side through. “Full credit to Andrew (Charter) and guys like Lalit (Upadhyay), who scored from both his efforts in the shootout. It was something we had worked on in training and I’m happy they were able to keep their composure,” said the German. Kalinga, who reached the final last year as well, finished second on the league table with 28 points and UP were third in the standings with 25 points. In their league encounter, the Wizards had won one encounter 10-0, with the other drawn 2-2. The Wizards took an early lead through Florent van Aubel in the 4th minute, which was halved by Devender Walmiki’s 9th-minute effort. Kalinga equalised through Fuerste’s penalty corner conversion in the 35th minute and took the lead in the first minute of the final quarter through Billy Bakker’s brilliant turn-and-finish in the ‘D’. However, Akashdeep Singh equalised in the penultimate minute to send the match into a shootout. The Wizards took an early 2-0 lead through Gonzalo Piellat and Florent van Aubel but Charter then produced three saves in a row as Kalinga clawed back to make it 2-2. The tie went into sudden death and was decided finally in the eighth round as Akashdeep Singh hit the crossbar with his effort and Aran Zalewski converted his effort to send the Lancers through. Kalinga enter their second final in a row and will take on the winner of the other semifinal between Dabang Mumbai and Delhi Waveriders. The Wizards will take part in the third-place play-off against the loser of the second semifinal. It was an enthralling game of hockey that went right down to the wire. Both goalkeepers were brilliant during the shootout and kept their sides in the match but it was the Lancers who struck when it mattered most and moved into the final.